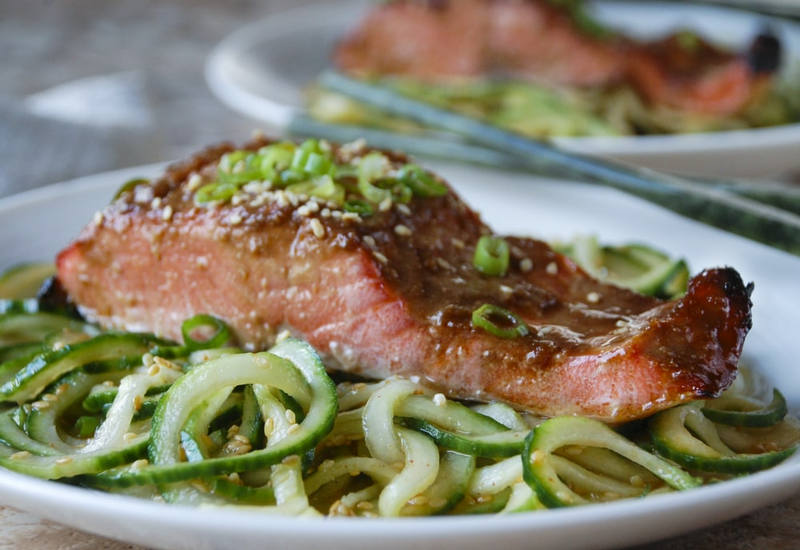 This sweet and savory miso glaze makes the perfect complement for salmon’s essential oils packed flavors. It is an easy combination of red miso paste, mirin, rice vinegar, soy sauce, ginger, sesame oil, honey, fish sauce, and sriracha. Pair it with sesame cucumber noodles for a crunchy texture that’ll have a blasting party in your mouth. Garnish with sliced green onion for effortless elegant presentation. Skip the calories with this healthy, low-carb dish that doesn’t skimp on flavor! When spiralizing cucumber there's no need to peel. Keep the skin on for maximum nutrient benefits and it makes the dish look nicer too! Per Serving: 665 calories; 38g fat; 22.7g carbohydrates; 55g protein; 144mg cholesterol; 1518mg sodium. This miso salmon is superb! I bet it also tastes really good with zucchini noodles. Also my first time cooking with miso paste. I replaced my salmon salad for this delicious dish. The spiralized cucumber is so refreshing, everything went together wonderfully. The salmon also tastes good cold oven the noodles. This dish was light and delicious. I really liked using spiraled cucumber instead of zucchini. Definitely one of my favorite salmon recipes for any time of year.